With the racing season well under way, the last thing any of us need is to get ill. It started with swollen glands high in my groin – these developed over a week until they were the size of golf balls. I needed help. A blood test indicated I had glandular fever. This was a blow and it came as a huge shock; I had only ever heard bad things about glandular fever and the time it takes to recover. It was an immediate halt to exercise, rest at home for a week, then another blood test to see if any improvement had been made. We had recently returned from the Essen regatta, somewhere we do not usually attend but this year it fitted into the calendar very well. Essen is a traditional German regatta, great fun to be a part of and a very different experience to the formal World Cups we are used to. Racing is held over two days with a different event each day. I raced in the four, where we were beaten on the surge by a fast German crew that just managed to out sprint us on the line. However, the main focus and preparation had been for the eight on the following day, and so with fire in our bellies after the narrow defeat the day before we attacked and stormed into an early lead. We won the race, beating the reigning Olympic champions Germany, and finishing off the weekend very well. Not long after returning from Essen and with preparations for the Dorney World Cup well under way, I was taken out of the boat and sent home to recover. It was a frustrating time knowing that I was going to miss out on the first international regatta back on the Olympic course since the Olympics. After a week off training the results were positive. There was a significant reduction in the infection and I was given the all clear to start exercising again. I was to take it steady, with a week of light aerobic training and weights. There was no pressure for me to get back in the boat before the regatta; I wouldn’t be racing so I could take my time, build my strength slowly and get back in the boat when I was totally recovered. I made use of the time and enjoyed it. The Dorney World Cup came and went. I stood on the bank and watched the guys pull back from a poor result in the heat to win the event overall. Considering the unsettled lead-up this was a very good result and something the crew were quite rightly proud of. The next day I was back in the boat along with George Nash (Olympic bronze medallist in the pair) who had been finishing his studies at Cambridge. We hit the ground running, I was feeling well recovered and strong and the boat seemed to fly. We had an excellent two weeks of training where we were finding speeds we hadn’t seen before. 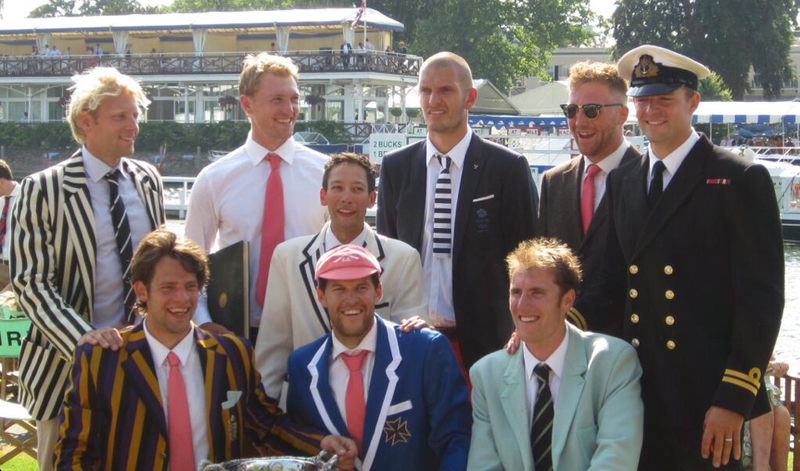 Motivation was high, we were all looking forward to the Henley Royal Regatta where we would race in an international event called ‘The Grand’, representing our clubs. It’s a chance to really enjoy a historic, traditional event on the Thames, something we all relish and love being a part of. The entry was small but we came up against Washington in the final, who had beaten Poland to get there. We were expecting a very tough race. We started hard, rowed well, the boat felt energetic and had plenty of life. We gained an early lead before the end of the island, three hundred metres, in and maintained this for the next two thousand metres. Crossing the line we discovered we had won in a record time, the fastest crew to have ever rowed over the Henley course. A proud day for us all in front of our friends and family. The 2013 winners of the Grand challenge cup, a right motley crew! 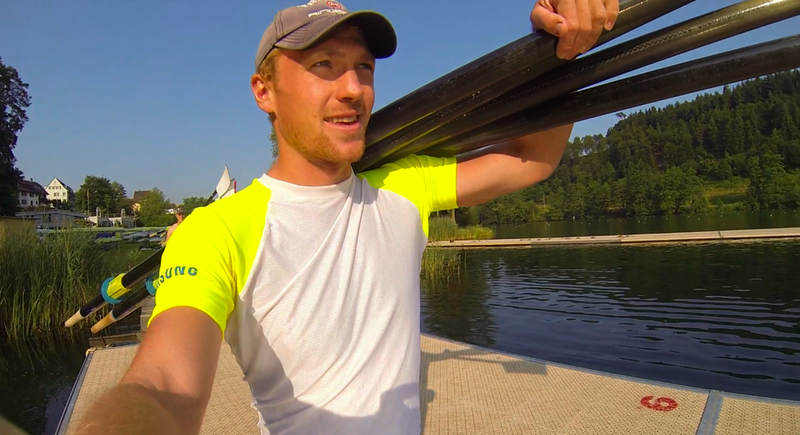 There was no time to dwell as we were back to training the next day and on the lake preparing for Lucerne, the final World Cup of the season and a regatta with a big emphasis. It is the last chance to test speed out against the competition before the World Championships, to find out what needs to be done or how far ahead you are. Full of confidence from Henley we headed out to Lucerne sure of a good result. We would be meeting the German eight again and a new USA crew. We were under no illusions that these crews would be quick, but we were confident with the speed we had. Carrying the blades down for an outing on 'The lake of the gods' - a highlight of the year training and racing at Lucerne. The heat was underwhelming. We were missing the spring we had felt from Henley, that excitement in the boat and the long confident strokes we had been working towards in training. We found ourselves in the repêchage, which again was lacking. There was something not quite right, we weren’t locking onto the speed we had been getting in training and we couldn’t quite put a finger on why it wasn’t working. Thankfully we made the final, but we were beaten into fourth place. An extremely disappointing result, and one we had not hoped for. There was a little confusion among us about why we hadn’t performed, which we discussed at length. I believe there are a few genuine reasons for it, but ultimately it comes down to the fact that we were beaten by three crews that were better than us on the day. We have some work to do in the next month before the World Championships, but just like last year before the Olympics, that is exactly what we will do. It’s no bad thing to be beaten,as it will give us targets. We now know the winning crew is three seconds faster than us so we must gain more than that to be winning in South Korea. We will head up to our mountain retreat in Austria and go back to basics, revisit each and every part of our stroke. We will push ourselves that little bit more knowing we aren’t good enough and we will arrive in Korea a new boat and a new crew. Whether we will have done enough we will soon find out, but every day until 1 September we will be thinking about the USA, German and Dutch crews that put us behind them in Switzerland. Don’t write us off just yet, we have plenty more to give.